Does that look like a gluten free vegan meal to you? It's one of those fabulous recipes that I wish I could say I created! 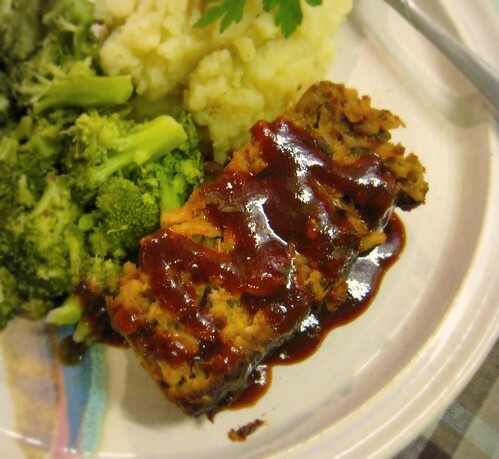 This "meat"loaf is from Susan O'Brien's new cookbook "The Gluten Free Vegan". I bought this cookbook out of desperation a few weeks ago when I decided to follow a vegan diet to see if I could naturally lower my cholesterol. It was one of the very few books I could find with both gluten free AND vegan recipes. What I like most about Ms. O'Brien's new cookbook is that is she doesn't solely rely on soy-based meat substitutes. Since I have to follow a soy free diet, it can be hard to find vegan recipes that don't include products made from soy such as tofu or tempeh or wheat gluten products like seitan. This recipe has NO soy or gluten whatsoever, and it turned out beautifully! I recently contacted Ms. O'Brien and asked her if I could share a few recipes from her new cookbook with you and she graciously responded, "Absolutely!" So you can thank Susan O'Brien and her new cookbook, The Gluten Free Vegan for this delicious recipe! Preheat the oven to 350 degrees Fahrenheit if you wish to bake rather than saute the meatballs. In a large skillet, heat the oil and saute the leek and onion over medium-high heat for 4-5 minutes. Add the garlic and continue to cook for a minute or two. Add the mushrooms and cook until they are soft. Transfer the cooked vegetables to a large mixing bowl. Add the cooked rice, mashed potatoes, pecans, herbs, tomato paste, salt, and pepper. Press tightly into balls (press hard, so they'll stay together) and saute on all sides in a large skillet in 1 to 2 tablespoons of olive oil over medium high heat. Once the balls are browned, lower the meat to medium low and cook until heated through, about 5 minutes. If you prefer to bake the meatballs, place them on a large cookie sheet and bake at 350 degrees Fahrenheit until heated through, about 30 minutes. If you want to make a "meat"loaf out of this recipe, simply pour the mixture into a greased loaf pan and bake for 30 minutes on 350 degrees. We poured our favorite barbecue sauce on top. Yum! I decided to serve yukon gold mashed potatoes with this meal, so the first thing I did was boil the mashed potatoes so I would have 1/2 cup mashed and ready to go to make the "meat"loaf. I love the yukon gold potatoes because they *look* like they have butter in them since they are a lovely buttery yellow color. I simply added 3 cloves of mashed garlic, a tablespoon of coconut oil, and almond milk to the potatoes. Being the carb addicts we are, they were our favorite part of the meal! I just LOVED how easy and delicious this meat "loaf" turned out. I never would have imagined LIKING let alone TRULY enjoying a "meatless" meatloaf. I would serve this to my meat crazy family and I think they would really enjoy it. The combination of flavors with the mushrooms, the leeks and red onion, and pecans, and the herbs... this recipe is DEFINITELY a winner in my book! Enjoy! You know, normally I'm kinda turned off by vegan "meat-like" foods, but this looks tasty. I think I'd actually really enjoy it! :) Good job. I don't like mushrooms. Can I leave them out, or do I need to substitute 2 cups of something else? Tasty Eats -- Thank you for the super nice comment!! I agree, this is definitely a GOOD "meat" alternative... I'm like you, normally I shy away from this type of food! Bill -- 2 things... 1st.. I don't think you taste the mushrooms that much, but then again I like mushrooms so i'm probably not a good judge of that! ;-) Since the mushrooms make up a big part of the body of the loaf you definitely need to replace them with something... My guess is that you could use 2 cups of gluten free bread crumbs or even better use 2 cups of cooked, finely chopped eggplant or yellow squash or zucchini, since the texture of those vegetables is similar to that of cooked mushrooms!! ;-) Let me know what you end up trying! I actually discovered it by accident AFTER I bought Gluten Free Vegan, because I too am overweight, have health issues, and frankly, just going gluten free is not enough. So now I'm a gluten free vegan! We can do it! I'm going in for blood tests in 3 months. If there's any appreciable improvement, I can guarantee you, I'll be vegan for life!...gf of course. even if you don't stay completely vegan, you can have vegan days/meals, which is what we do. I know all the comments on here old but I wanted to say how much I enjoyed this. It was delicious. I added the spices I like and squished up some peas and sweetcorn and added a little more mashed potato (I always alter recipes). It was so tasty!